Cobourne Garden Reserve is a beautiful array of tenderly landscaped garden terraces leading from the road side, down to the waters edge. Established and cared for by some of Port Waikato’s enthusiastic locals, garden lovers will enjoy a most pleasant walk through this botanical delight. 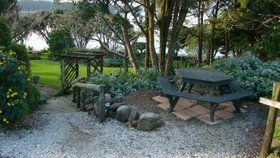 Alternatively, pack your hamper and a blanket to enjoy the perfect picturesque picnic spot. Cobourne Garden is located at the top of the rise, just after the Wharf Store when heading towards the beach.